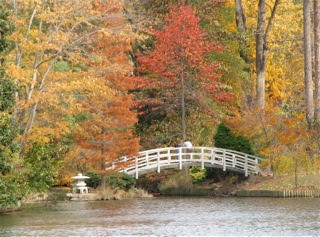 Often spoken of as "the crown jewel of Duke University," Duke Gardens occupies 55 acres in the heart of west campus. 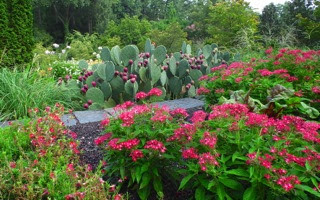 It's recognized as one of the premier public gardens in the United States, renowned both for landscape design and the quality of horticulture, each year attracting more than 300,000 visitors from all over the world. We first visited Duke Gardens in late November over the Thanksgiving holiday. The fall colors were gorgeous and we were blessed with visiting on the day that a huge ginkgo tree lost its leaves. They usually drop all their leaves in one day or at least most of them. It was such an awesome sight to behold I was mesmerized. However after coming back home I realized I didn't get one photo. I just stood spellbound watching the scene in slow motion. It seemed such a spiritual experience. There were children running around under the tree as if snowflakes were coming down. Adults, many Asian, were picking up leaves carefully and stacking them in their hands. The most recent visit in early September was much more colorful with many more plants in bloom. All of the fountains were refreshing to view since it was warm instead of chilly. 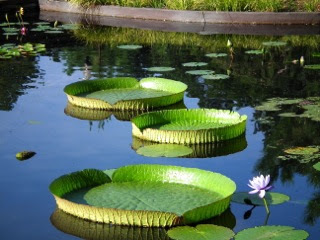 There were some huge "quiche dish" type of plants in a few of the ponds and we were excited to be able to find out what they were by searching online. They have quite a story about them on the photo information in the album. Matter of fact it was so warm that we decided to skip a couple of areas that we had viewed on our first visit. They were both areas of shade so the appearance wasn't much different. View Autumn Visit to Sarah P. Duke Gardens. View Summer Visit to Sarah P. Duke Gardens. If you're in the area, another great garden and nature trails place is at North Carolina University at Chapel Hill. It has the North Carolina Botanical Gardens, Coker Arboretum, Battle Park, and herbarium, etc. Lots of nature trails through preserved areas also. Free tours are offered at some of these areas. Check their schedule.